HILL AFB, Utah --- The Ogden Air Logistics Complex reached a major milestone in extending the life of one of the Air Force’s most tested and flown multi-role fighter fleets. An Air Force Thunderbird jet was the first Lockheed Martin F-16 to have a service life extension – modifications that will add more than 4,000 flight hours to the aircraft’s lifetime. 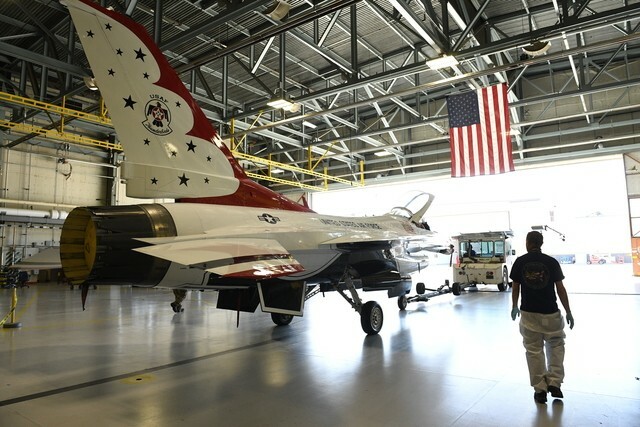 The aircraft is one of about 300 refurbished C and D models of the F-16s that will roll off the shop floor of the 573rd Aircraft Maintenance Squadron at Hill AFB, Utah after receiving structure-strengthening modifications, the USAF announced on May 3. The F-16 service life extension programme is aimed at keeping the fighters flying until close to 2050. The jets became operational in 1979 and were originally deemed air worthy for up to 8,000 flight hours, but will have their life extended up to 12,000 flight hours as part of the programme. The jets will receive a dozen structural modifications, including changes to their bulkheads, wings and canopy. The Thunderbird jet was the first of four F-16s that will be used as validation and verification aircraft. Maintainers will use lessons learned from these first aircraft to better establish the cost, workflow and timeline for the modification of future aircraft. Once the final processes and workforce are in place, the USAF’s goal is to complete each fighter in 9 months at a cost of $2.4 million. Se os poderes que mandam vêem isto, para além do upgrade para a versão V ainda aplicam o SLEP em cima e ficamos a operar F-16´s até 2050! Lockheed Martin has reached an agreement with AIM Norway to jointly form the first F-16 ‘Falcon Depot’ centre in Norway to serve the global fleet. It will be established in Kjeller, Norway, at an existing maintenance, repair and overhaul (MRO) facility used by the RNoAF. Through the partnership, Lockheed Martin intends to leverage AIM Norway’s F-16 sustainment knowledge to benefit F-16 customers across the globe. Lockheed Martin is the original equipment manufacturer and design authority of the F-16 multi-role fighter aircraft. The company selected AIM Norway for its extensive technical expertise and MRO experience. Lockheed Martin F-16 Program vice-president Susan Ouzts said: “Lockheed Martin is extremely proud of our longstanding relationship with AIM Norway and Norway. Lockheed Martin expects F-16 production opportunities to total more than 400 aircraft, allowing it to increase the global customer base. Currently, more than 3,000 F-16s are in service with the armed forces of 25 countries. The F16 is equipped with the Lockheed Martin LANTIRN infrared navigation and targeting system.